When we think of catnip, we think of cats. Perennial plant-laced toys, bells and teddies stuffed to the gills with catnip simply for the sheer enjoyment of the gift receiving feline. While jingly balls and stuffed socks are likely less amusing to humans, there are actually quite a few instances where the sought after substance within, the catnip, can be beneficial to the owners of the domesticated purr machine. Chewing and eating the raw plant of course is much less people-friendly, however catnip tea has been brewed and used for many years for a variety of ails. For people who are having trouble sleeping, catnip tea benefits can include helping you drift off into dreamland. You’ll notice a sedative like state come over your kozy kitty after a catnip snack, and while you may not experience the same blissful drooling sprawled out across the floor that your cat does, you may certainly find that a piping hot cup of this cat concoction can help you get some zzz’s. In fact, don’t be surprised if your box of herbal sleep aids already has a smidgen o’ catnip packed inside, it’s not uncommon for Nepeta cataria to end up in medicines. 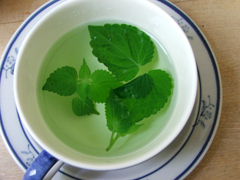 Because it’s normally gentle and effective, many people turn to brewed teas made of catnip as natural sleep remedies. While relaxation and calming can be great at bedtime, catnip tea benefits aren’t only for after 9 p.m. Relieving stress is another key element to catnip’s allure and calming can occur at anytime of the day because it’s as mild as it is effective. Another way that catnip tea benefits can help soothe your mind is to help take the edge off of migraines. Whether due to the chemical composition of the plant, or simply the reduction in stress overall that can help reduce the burden of a crushing migraine headache, catnip tea benefits are thought to help alleviate these painful plights via one means or another, according to sufferers. There are a whole host of other interesting applications for this ornamental plant. It’s even a useful herb in the kitchen, and can be added to numerous tasty dishes. In the garden, it serves as a deterrent to pesky aphids and cockroaches, mosquitoes and termites, and attracts desirables such as butterflies and, of course, house cats. As a matter of fact, the mosquito repelling properties of catnip are more potent than spray on repellents by as much as tenfold, however, unless you are sitting in a flowerbed full of them, it’s unlikely to be very helpful. Catnip tea side effects are minimal and mild if existent at all, however, smoking the plant has been indicated as unsafe. In some cases headaches and vomiting or the feeling of illness have been reported. These effects are uncommon however, and most people can enjoy catnip tea benefits without any adverse reaction. Calming, relaxing and rejuvenating, catnip is not just for cats. It can provide many people with a sense of serenity and peace that is unmatched in other herbal teas.